"The importance of TeNS as an analgesic technique .. has been confirmed." 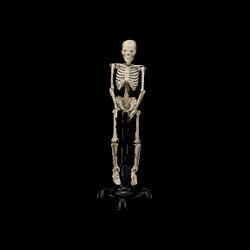 This miniature bone coloured skeleton (8in/20cm high) model is flexibly wired to allow movement and positioning of the arms and legs. 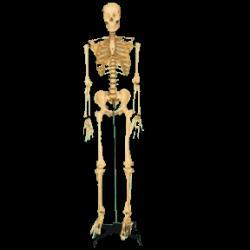 With removable arms and legs this model is 18in/45cm high. The skull features a flexible jaw with springs, plus the top half opens for a look inside. Made from reinforced plastic, with an inflexible spine and 33in/85cm high. 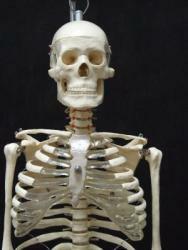 Details include the spinal cord, nerve roots, herniated disc and the vertebral artery. Articulated joints allow for movement. The arms and legs are removable for study. Features nerve branches, vertebral artery and herniated lumbar disc. Containing our Knee, Elbow and Hip Joints. 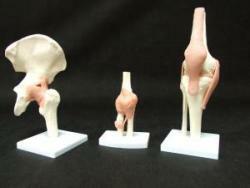 All these are functional models with ligaments.